Welcome to our contribution to the Blog Tour for the Before Happily Ever After middle grade adventure series by author Ann T. Bugg. When best friends Valerie and Samantha discover a magic mirror in Val’s 100-year-old barn in southern Minnesota, they eagerly go through it. Immediately they run into the young Snow White, who has just escaped the huntsman. The girls vow to help her find her father, knowing the dangers that await. On their journey, the fun-loving double-trouble duo quickly discover they are caught up in the middle of their favorite fairy tales. Having the knowledge of the stories as their only weapon, Val and Sam help two other princesses, make a surprising friend and discover they have a fairy godmother of their very own. What it’s about: This book is about two girls named Valerie and Samantha. In the story, they go through a magic mirror and suddenly find themselves in another world and in the story of Snow White. What I liked and didn’t like about it: I liked that it was an adventure. I liked that it also had the stories of Sleeping Beauty, Cinderella (who was named Danielle! ), and Snow White. The Mom in the story was really funny because she mixed up names for pets like a turtle named Fluffy and a dog named Otter. I also liked that they followed a possum into the world and the possum was really somebody else that was a surprise. I didn’t like that the story had my name in it which is Danielle. I’m not sure why it bothered me but I think it was because I don’t like it when other people use my name in books. My bottom line: I loved, loved, loved this book and I would highly recommend it to just girls (because boys like reading about boys) who are 7 years and older. What it’s about: Best friends Valerie and Samantha travel through a magic mirror to a different world where they encounter a young Snow White who is being chased by her evil step-mother. Val and Sam help Snow and two other princesses by using their knowledge of some familiar fairy tales. Along the way, they meet some friendly faces, but will they be able to avoid peril when they come face-to-face with the evil step-mother of legendary tales? The story largely centres on Val and Sam meeting up with Snow White and we follow her story until she is safely housed with the notorious seven dwarves. While the dwarves are never named, they each exhibit special “characteristics” and we had lots of fun guessing which dwarf was which! It made me realize that my kids have never seen the movie Snow White because it is actually one of the more frightening Disney princess movies. We have read the book though so they did know about the seven dwarves. As Val and Sam help Snow in her quest to find her father, they encounter baby Briar Rose/Aurora and are witness to the events around her birth (i.e., the uninvited fairy who casts a wicked spell on the baby). They also become entangled in the story of Danielle (aka Cinderella) who is held captive in her castle by her evil step-mother. Val and Sam then use their knowledge of the stories to help out all three princesses. We really liked the mix of familiar stories as seen and interpreted by the modern day characters of Val and Sam. For the record, my daughter was perturbed by the use of her name in the story … although I think neither of us really knows why! The characters in the story are each uniquely developed. We meet the quirky Mom (Val’s) who looks after the menagerie of oddly-named animals on the farm and whose love of fantasy movies and fairy tales gets passed down to her daughter. Might I just say how I COMPLETELY appreciated the references to the movie “The Princess Bride” (LOVE that movie!). We are also introduced to Wilhelm and Dorothea, the loving childless couple who kindly take in Val, Sam, and Snow. They are the dream parents and Wilhelm turns out to be a bit of a surprise! In some ways, Val and Sam are somewhat underdeveloped as main characters. We learn some things about their relationship as friends and they certainly have much of the dialogue, but I feel like there is more to be learned about the girls themselves. So much of the book is focused on what happens in the story, the relationships between the girls and the princesses, and the girls responding to situations they find themselves in. We learn more about Val and Sam through their responses and interactions with each other and with other characters than through their own thought processes. Regardless, they were solid likeable characters that I would still love to read about more. My bottom line: This book was a delight to read with my children. The twists and turns in the plot as well as the weaving in of familiar fairy tales into a new story was so much fun! I would recommend this book and the next ones in the series to children aged 7+. It’s time for Samantha’s summer visit again. Both she and Val are anxious to see if they will take another magical journey through the mirror. After learning of a problem with one of the horses, Odette makes her appearance and tells the girls it’s up to them to help him. What Charlie needs is something that can only be found in their magical land. It can’t be given to them; they have to solves riddles and discover the answers themselves. A family of elves guides them, but even elf powers are limited when it comes to what stands between the girls and what they seek. Trolls and unicorns were everything they imagined and more, but rescuing Rapunzel from her tower was an added bonus they never saw coming. Valerie and Samantha are disappointed that their schedules were not allowing them to spend a week together this summer like they have done every year since they were young. Their parents are able to plan a weekend camping trip towards the end of summer. The girls are happy for the visit, but sad to think they can’t go through the mirror this year on another adventure. They discover the magic is not only within the mirror, but within themselves when they are together. Merlin the magician shows up to take them on their quest to help Arthur find his true identity and his place in Camelot. Ann T. Bugg is the Queen of her castle in southern Minnesota where she lives with her Knight in shining armor (who has come to her rescue more than once) and her own little Princess Valerie. The pets in her magical kingdom come in all shapes and sizes, as do all the critters that make their way out of the enchanted forest. 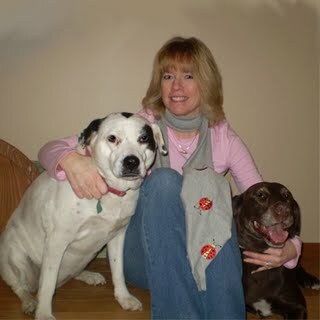 Horseback riding, long walks with her dogs (Otter & Dottie pictured above) and embroidering are on her list of hobbies, but writing will always be her first love. Ann also writes Women’s Fiction under the name June Kramin. Open to: Anyone who can legally enter (WW). Terms and Conditions: Winning Entry will be verified prior to prize being awarded. No purchase necessary. You must be 18 or older to enter or have your parent’s permission. The winner will be chosen by rafflecopter and announced here as well as emailed and will have 48 hours to respond or a new winner will be chosen. This giveaway is in no way associated with Facebook, Twitter, Rafflecopter or any other entity unless otherwise specified. The number of eligible entries received determines the odds of winning. VOID WHERE PROHIBITED BY LAW. Thanks for the share & for the great review. Sorry you didn’t like your name in it. I usually take orders for a name mention in a book. LOL! I hope you like the rest as well! I loved your review! I too read this book and really, really enjoyed the modern take on some classic fairy tales. Loved the characters of Val and Sam. Great to see a youngsters take on it as well. Looking forward to more from Ms. Bugg. Hi Paul, Thanks for popping by – glad you enjoyed the book too. I hope that your new book, Lionel’s Christmas Adventure, is being well-received! The buzz is good! Best wishes! I’ve never heard of these stories before, they sound great. I’m off to try and find out if I can get them in the UK. If not, I may be on to my family in the US! Thanks for sharing these. I can’t get enough of fairy tales Thanks for doing this giveaway, Renee, and having it be part of the blog hop! Hi there! Stopping by from the Kid Lit Blog #6! (Of course, I’m sure you’d know that! LOL) Great books! Though I will have to wait for my 4 yr. old to be older. Interesting concept. Nice double review. I love your mother/daughter review. Such a great idea and these books sound really interesting. So fun to hear new twists in familiar stories. Great reviews, and I love your Mother Daughter Book Reviews format, too. Funny about the name issue, because my name is Valerie, and I can’t remember the last time I saw a main character with my name. These books look fun, and glad I found out about them here. I love reading your daughter’s reaction to the books you both review. So often, kids have a special perspective to offer, or even one that just wouldn’t have occurred to an adult. Names are incredibly powerful things! Hi Susan, Thanks for stopping by and leaving such kind comments! Both my son and daughter surprise me sometimes with the things they say in reviews. They have a completely different perspective than adults when reading a book. This has been a fun process for us.